I'm bothered by a lot of these tests. eg. The train. If the train goes around the track faster with batteroo then they can declare it a "win" even if it only lasts half as long. A better test might be "How many times does it go around the track?" and totally ignore the overall running time. It's less correct technically but I really think that "number of times around the track" would be a better set of numbers to show the public. While I wouldn't disagree with clearly defining the rules for the test, I have to say it seems like you are trying to define the test in order to wind up with the result that the Batteroo fails. You should define the test solely based on what you think the typical end user would desire. If you think users are going to want longevity in their toy train, total number of laps would be the appropriate measure. If you think users are going to want consistent speed in their toy train, wall clock time until the train fell below a critical threshold speed would be the appropriate measure. If you don't really know what users are going to prefer, maybe this isn't the test you want to perform? I think any test can be viewed from two or more angles. The point is to prove they lied about the 80% more battery life, and that it actually decreases life ( maybe not all cases, I don't see on yet ). There is no doubt the sleeves will have their value, like someone said in the other thread, toys might benefit from the boost converter ( lego trains that chu chu constantly, cars that run at constant speed instead of crawling, a large amount of toys ). Also there are other tests suggested that should cover what you are saying like the lightbulb or the wall clock. I think some people might prefer the train to run as fast as it can until the batteries die, some will prefer the number of rounds around the track. Speed and time equals distance, so beside the inherent losses due to efficiency, you might say the trains travel the same distance, it's a matter of opinion if I care about the speed or the time (slower train). Right. So given the dilemma of different viewpoints, one should be prepared to back their test procedure up with some kind of meaningful rationale why a particular viewpoint was chosen. So you may do a survey of 100 users and find at which point do they consider the batteries "dead" for a given product, whether the product is a train or toy slowing down to a certain minimum speed, or a flashlight/light bulb dimming to a certain point. Based on the answers you get and how tight the distribution is, you could also infer some relevant information on how valid the test even is. If there is a very tight distribution, you can say with confidence that your test's endpoint criteria is statistically meaningful. If it's a wide distribution, there is a wide variance of opinion and maybe using this device under test is flawed from the outset. Now I realize nobody is going to do any surveys/focus groups. Instead, you will make an engineering judgement about the finish criteria. Just be prepared to back that selection up with a meaningful explanation other than "this criteria was chosen because we feel like it will make the Batteroo lose". This is why testing on "passive load" devices is going to be difficult, because defining the failure threshold is a matter of subjective opinion. Regulated devices are so much easier because they will definitely get to a point where they will simply shut off. Just need to make sure that it's a fairly realistic test, or if you can replicate a test that Batteroo themselves have done (such as the GPS unit with the finger poking device--which is not a realistic usage scenario, but it does prove to show that they cheated on the test). Even the Apple keyboard might be a good test, I know it's a low power device, it will wake up when a key is pressed, so like they did on the Garmin, we can do on the keyboard, keep a key pressed this in turn will keep the micro awake, when the level is ~11% place the sleeve over the batteries and check how much it lasts (number of keys pressed). Two tests like that with their own use case should prove something at least. I know it will take longer. In this case there is no opinion to be had, you just have one output, the number of key's pressed. You can't take sides, no survey to do . So given the dilemma of different viewpoints, one should be prepared to back their test procedure up with some kind of meaningful rationale why a particular viewpoint was chosen. Or record longevity and number of laps. Add a lap counter to the train. I thought about using a photodiode and an Arduino to count the laps and lap times, but the video is all you need, you can do it yourself, if you like. Would be a nice test for OpenCV. The train test is done, pretty embarrassing for Batteroo Will make a nice video now and upload it. True, that basically means finding out the energy extracted from the battery, that energy can be extracted in different ways. Not saying it's not a good test. I think we should also find some tests that anyone can support. For example I think everyone can agree the more pictures a camera takes the better, there is nothing to say about that, you can't say it took them faster with batteriser than without, you can't pick sides depending on the test. The test's can't be evaluated in different ways. OTOH if it's embarrassed itself then no need for anything fancy. The camcorder needs ages to transfer the video, not the latest model. But I could already create some data to create efficiency curves. TL;DR: the Python measurement script and the data. The op-amp has a terrible offset and doesn't seem to be much linear, or I don't understand how to build it right, but it is short term stable and at least strictly monotonically increasing, so I could program a binary search in Python: The PSU channel 2 is set to 0 and step size to something big. Then the shunt voltage is measured with the Hameg multimeter. If it is lower than needed, the step is added. If it is higher, the step size is halved and subtracted, until the step size is reasonable small. Of course, after adjusting the current, the input voltage has to be adjusted again, too, because of losses in the uCurrent and wires, so that the exact desired voltage is at the Batteroo sleeve. The sleeve itself has 3 connections: input, output and ground. The idea from razvanme to use a metal strip from a 9V battery was excellent, I stuffed a battery with the sleeve in a solderable battery holder and the stripe connected to the Batteroo input, but isolating the plus terminal of the battery. So I didn't had to solder anything to the sleeve and the dummy battery acts as a heat sink, too. The input connection is then connected to the first PSU channel (after the uCurrent). 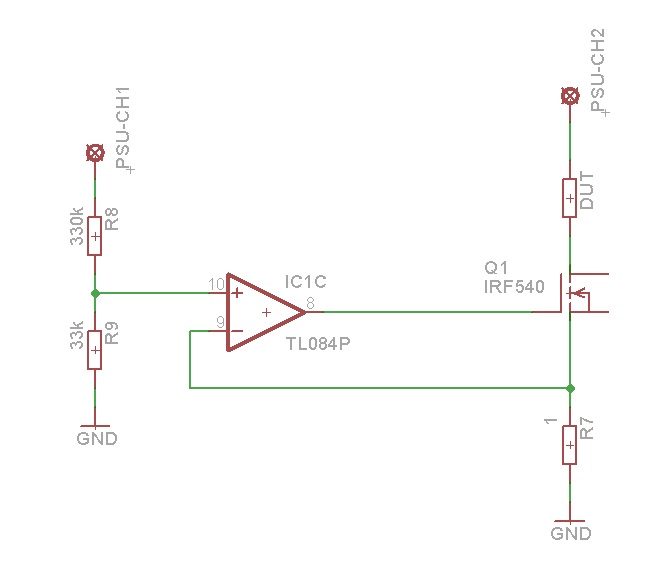 The output is connected to the electronic load and ground is connected to ground. Each of the 3 connections have sense wires, which are connected to the analog mux and switched in pairs to the voltmeter. That's not fast, but I don't care if it runs an hour. With this I could automate to measure all four values (input voltage, current and output voltage and current) for 0.6 V to 1.6 V input voltage, in 0.2 V steps, and for each voltage the load is stepped through from 10 mA to 100 mA (need a higher shunt for lower current, because the resolution gets too low, and a lower shunt for higher current). See the script for details (still a bit rough, just a quick hack). 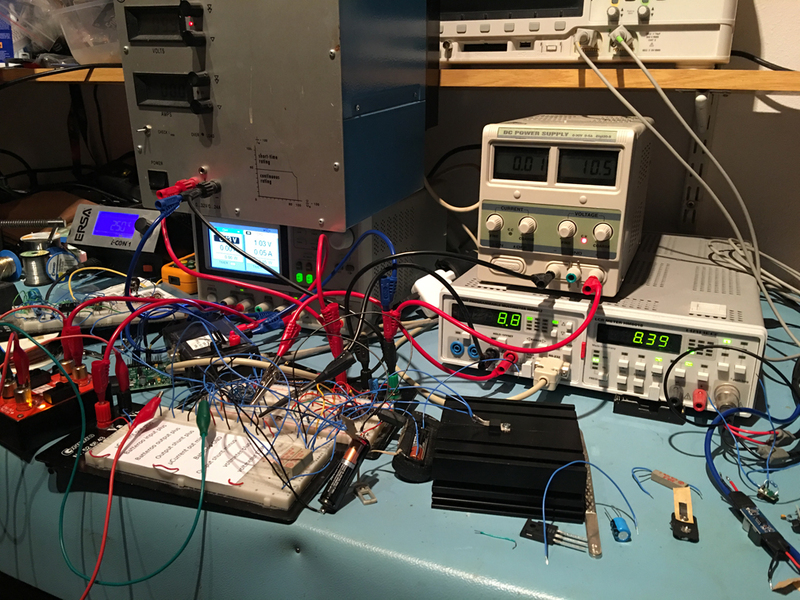 The values seem correct at first sight, the output current increases in steps of 10ma so the load is working correctly, the input / output voltage is constant, seem like good tests. Based on the data you provided the efficiency of the controller is between 77% and 88%, it varies but steadily increasing with higher voltages. Maybe for a higher current it will do better. Toys were supposed be one of their big things. It seems to "use up" the 20%(or is it 800%!) 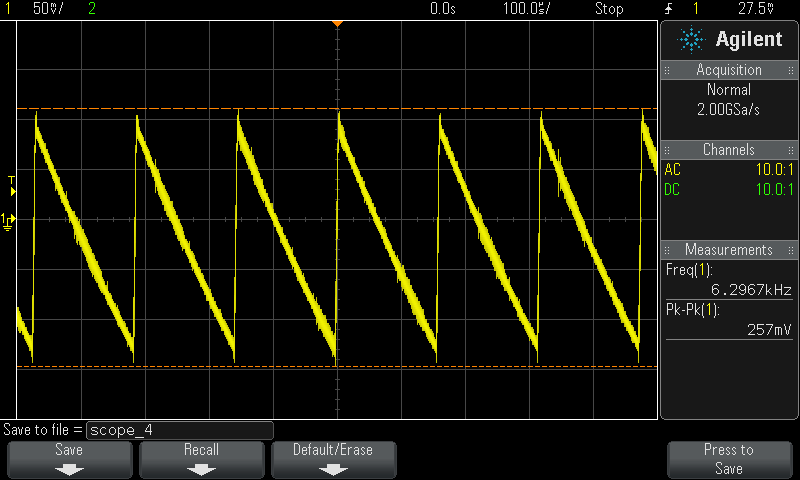 that's supposed to be left at the end, and will be worse with the higher internal resistance <1.1V. At least the battery meter will still work sort of. I wonder when the first complain about hissing audio product appears on Indiegogo. I'll finish the MP3 player test, but don't know if it makes sense to test a flashlight. And the edges look pretty steep, might have EMV problems. Who wants the two sleeves next? One will be shipped with the construction with the battery holder, for easy measuring. Would be cool if someone with ESD/EMV equipment could take a look at it, or verify the efficiency results with a non-bricked eload, or test the current limiter. Wow, that is pretty poor results. Thanks Frank! Looking forward to seeing more tests by someone else for comparison. Would be cool if someone with ESD/EMV equipment could take a look at it, or verify the efficiency results with a non-bricked eload, or test the current limiter. Would be great to see their EMC tests repeated with a realistic current draw, rather than the 1k load (IIRC) load they used! The efficiency is pretty bad, but so is the line regulation; I wonder if the latter is deliberate, and they were thinking all along about battery gauges? 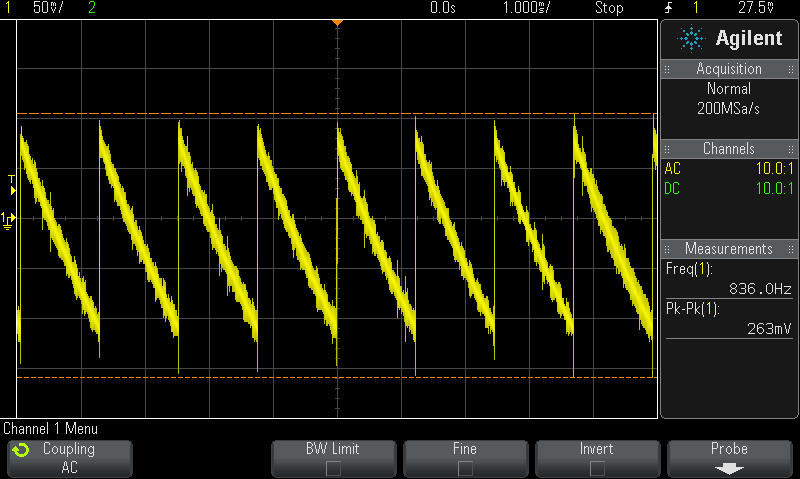 It looks like a variable-frequency converter. The ripple is not surprising given it basically has no output filtering. At least 2 uA quiescent draw are not so bad, I think Jay_Diddy_B's batteriser prototypes was about 20-30uA. They are probably relying heavily on capacitors at the battery input in the 'DUT' for filtering, but there could be anything from nothing to hundreds of uF and no clue to what quality caps they are either. To get decent efficiency over a wide range, you have to set a minimum pulse width - say 5% - and then below about 5% load, the frequency is varied. So you can get kHz switching frequencies - and big ripple at low currents. Double the current and the ripple will probably halve. I'm pretty sure Batteroo said it was 1.5MHz somewhere? You mean those same capacitors in the product that help prevent the pulse current from causing the dropout voltage problem that Batteroo are so proudly sprout as the key to why their product will be so useful? We can work out the output capacitor value from Frank's waveforms. With 100 ohm load, the output current is 15mA. The voltage drops about 200mV in about 150uS. So C = 150uS x 15mA / 200mV = 11uF. So they will be using a 10uF multilayer ceramic capacitor. Probably what you would expect given the space.